In 2014 we at ASFM gathered as a community to develop our next Strategic Innovation plan which would guide the general direction of our school until 2020. One such project was the Edge of Excellence Annual Giving program headed by our Superintendent Michael Adams. While programs such as these are common in many Universities and International Schools, it was a very new concept at ASFM. What has been remarkable has been the creation of spaces which would not have been able to be brought to life with out this campaign and the generosity of our community. Produced by our stellar Communications department, I hope it provides insight into some of the projects that have come to life. The ASFM Innovation department has been involved with not only the leveraging the Design Thinking process to bring a human/student centered approach to the development of learning spaces but also to the whole process of engaging with the community to bring these concepts to life. Throughout the year we engage with our community through various empathy building experiences. We draw upon these experiences as we come up with ideas for the annual Edge of Excellence campaigns and connect them with the pillars from our Strategic Innovation Plan. Our ASFM L2E2 Design Process refers to this as the “Languages and Landscapes” of the community and serves as a primary filter. Once we arrive at a compiled list, we then wash it through various community groups including, parents, students, alumni, board, etc. to see what potential projects resonate the most with our community. From there, we select a set of 2-4 projects to build prototypes for to pitch to potential donors. Each project requires developing a design team of expert teachers, administrators, maintenance and facility leaders, and Innovation Coaches as Designers to develop a series of deliverables which translates the mission and vision of the school and for the project into a spacial concept. This becomes the primary document/manifesto we reference as we work with architects as we translate a provocation into a set of drivers and constraints, to spacial concepts to prototypes, layouts, sketches and renders and eventually blueprints and construction documents. By the time we inaugurate a space we know it as well as our favorite book or spot on the couch and we work for about a year afterwards to optimize use, effectiveness, and to align desired behavior with a spacial concept. These need to be living spaces which are agile and responsive to student needs for learning. The progression to this point where we have a clearly defined Design process with clear deadlines, deliverables and tasks to be completes has been a hugely collaborative and iterative process. Each year we learn from the last and optimize for impact with the student learning experience at the heart it. This is a very brief summary of said process but I hope it provides a glimpse into the great projects brought to life when leveraging the Design Thinking Process. Special thanks to Dr. Michael Adams, Helen Trevino, Marcela de le Garze Evia, and the whole Edge of Excellence Campaign team who made this possible and continue to “Dream Bigger” for our students. Since November we have been engaging with our Moonshots students on an almost weekly basis. The invitation brought students who were interested in redesigning school yet were unsure what that meant. Truth be told, we as a teacher group were a bit unsure as well. Our next step was to engage with students to provide some clarity and direction in regards to where we were going, how we were going to get there, and start putting some work in. What has been amazing is that our students have gone far further than we could have ever mandated. As mentioned in a previous post, in our first few meetings we explored the current reality, a desired result, and a better plausible future. 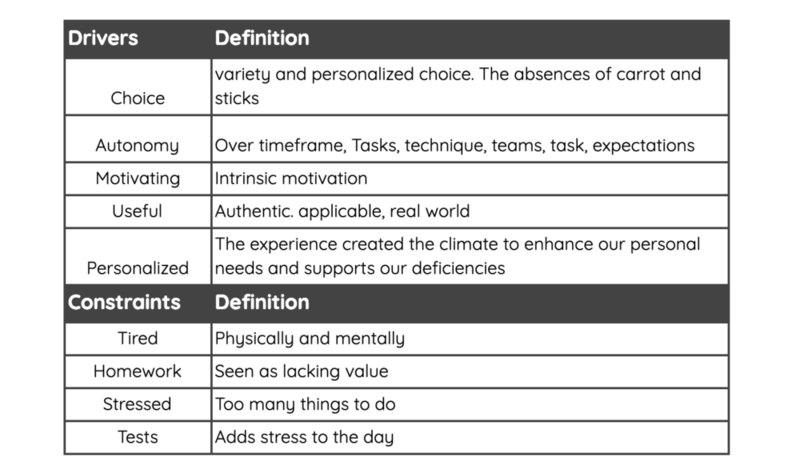 As a design team, this allowed helped us develop Drivers, (Choice, Autonomy, Motivating, Personalized) and Constraints (Tired, Homework, Stressed, Tests) but we needed to understand what students meant by this. In design we call this activation and validation, the process of saying to the user group, this is what we heard, did we hear correctly? Can you tell me more? What did we miss? Over the next few weeks, a series of group empathy activities took place where we prodded and probed for deeper understanding of the students experience and future desires for learning. Below are the initial findings from that series of meetings. 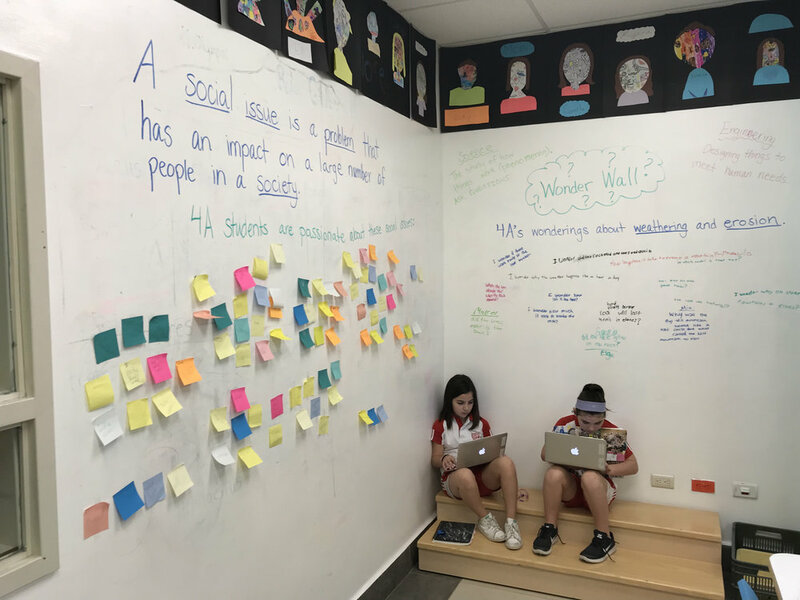 When we dug deeper for understanding we were very impressed with the level of sophistication to which our students could express and advocate for choice, autonomy, personalized and autonomous learning. We couldn't have scripted better responses if we tried. For example, “ we’re learning at a superficial depth in courses and there are topics which I would like to spend a significant amount of time on because I am interested and this would further develop my general understanding in the course or topic.” For personalized learning students would express that , “in a class of 20+ students I am always held up or holding up other students as we go through the content. This always results in non-optimal learning for everyone.” These are not students who are trying to escape from learning, they are trying to escape from learning which does not respond to their needs and enhance their talents and passions nor is the learning applicable in the “real world”. When it comes to understanding constraints we had to really understand what they are enduring and what obstacles to learning exist. I used to think that students were playing a collective con on teachers by claiming they were “tired”. By far when we have asked students how they feel when they are at school this has been the most frequent response. It’s impossible that they coordinated at this level. We had to dig deeper. Something we mention to students as we are going through this process as “Designers” is that everyday they are victims of design and I can think of no better example of students being a victim of someone else's prototype which is entrenched in tradition and ignores the needs of a user group than the “school schedule”. The user group it does respond to is parents, business, and adults in general but with what we now know about brain research ,sleep patterns and the needs for youth now, how is it that we we have not dramatically altered how we schedule school? This seems to be a major obstacle to optimal learning for this student group and greatly contributes to their stress levels and anxiety. Second to this is the general nature of assessment they are experiencing, mainly homework and tests. They are not seeking to absolve themselves from work but rather work which they see useless, irrelevant and uniformed. An example of their passion for learning and willingness to work, is the behind the scenes, out of the sight of us, creation of an ASFM Moonshots Project website. While we were working on facilitating this process and meeting with them once a week during their Access period, they were continuing the conversation and exploration among each other and with other students, even elementary students, on topics they felt were work challenging. Such as, schedules, sleep patterns, extra-curricular activities, teacher’s mindsets, and the overall purpose of school. Again you couldn’t have scripted this and we cannot be thankful enough. We just have to be the best we can be to listen to understand and guide the process with as little bias as possible. The challenge and opportunity continues. If you're starting to think about redesigning spaces, don’t take another step until you have a process. The product cannot proceed the process. Luckily, our journey at ASFM into the redesign of learning spaces coincided with my attending an event with David Jakes. Afterward we spent most of the 2015/16 school year researching and developing teams proficiency in Design before we installed our first space. This included reading of numerous books, pull out days for PD, bringing David to Mexico, and running various groups of students and teachers through numerous design charrettes. We intentionally went slow, listened to understand, and challenged ourselves to be vulnerable to fail loud and fast. David’s work with St.Thomas Aquinas High School. At the end of it all, we had collaboratively, with David Jakes, developed the ASFM L2E2 Design Process, a process not just for the redesign of spaces but for thinking differently about the learning experience. Process matters and Design is the creative and problem-solving process of the world, period. Better yet, we have modified it to meet the needs, respect the traditions, and respond to the language of our community. 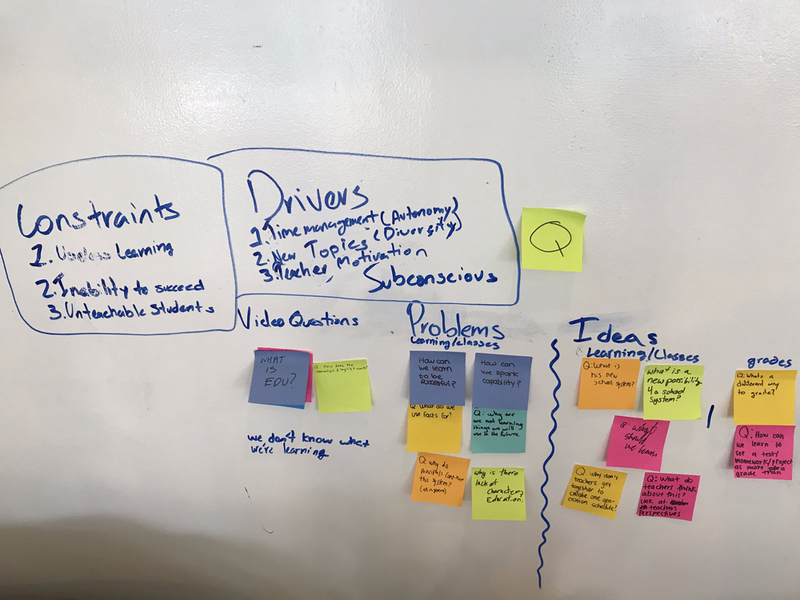 We now are in our second year of redesigning spaces and we can confidently say our process guides us to redesign the learning experiences based on our needs, goals, and collaborative vision for learning. In his book Change by Design, Tim Brown frames Discovery as Insight, Observation, and Empathy which has really resonated with our team. For now I am going to expand on "Insight" and reconnect with Observation and Emapthy in a later post. Insight goes beyond traditional research especially with the internet. Today insights are everywhere in digital and analog form and are free. For example, the thoughtless act of a student hacking a space to create a visual learning board offers a priceless insight into how they want to learn and can transition into an installation in a redesigned space. At ASFM we have used this resources to gain a pulse into the current status of our spaces as well as invite our team of teachers to a conversation about thinking about spaces differently . 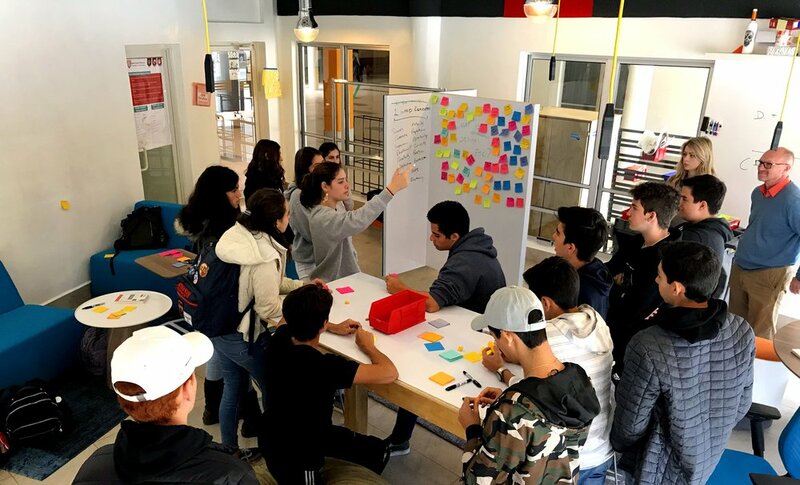 A useful activity has been the creation of a collaborative Google Slide Deck which summarizes the 79 ways design can transform teaching and learning, highlights what this looks like on our campus, explores where else this in action, and connects us to an additional resource for further info on he topic. What a great way to start thinking differently about space by being collabortivly creative and active. 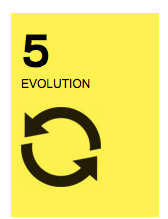 If you are unable to get your hands on the book, The Third Teacher Flashcards are a great jump off point when working with your community to redesign your space. We like to print them out, divide them into their 8 chapters, then have participants select the 5-10-15-etc which resonate with them the most. From there we can launch into ideation and creation of prototypes which bring these concepts to life at our school. When starting the process of redesigning learning spaces a few things are critical. Firstly, a local community to share, learn, and bounce ideas off of. Secondly, if you are able to connect with an outside expert to assist as a mentor, guide, or consultant this is just as valuable a resources as the money you are going to spend on installations. For us David Jakes has been a invaluable asset, guide, and friend who has now become less of a consultant and more of a colleague/friend/mentor. Lastly, resources such at the Third Teacher Book are great to have on hand to spark new ideas, refocus direction, and to invite others to the conversation. I am going to be sharing more of these over the coming posts , I hope you find them as useful as we here at ASFM have. Sometimes it's hard to know where to start or what is possible while sitting in our 30 year old classrooms of desks in rows, fluorescent lighting, and beige paint. To be fair, anyone would struggle for imagination in that environment. Therefore we find it useful to preview the process with teachers before going full on into the Design process which takes a lot of time, is an intensive process, and is often unfamiliar to teachers. The Edutopia video series below showcases a relatable middle school classroom which is transformed over the weekend with the help of a team of designers and community volunteers, all for $1000. It’s important to understand that a classroom redesign is not going to other schools or on Pinterest to see what other spaces look like and what solution you can import into yours. We are redesigning an experience and the space is a resource/tool to enhance that. Therefore the important thing we need understand is the current reality and future preferred state. Critical to the redesign of a space is the understanding and execution of the Design process. While watching this video, do so through the lens of a designer and watch for the various stages of the process. Discovery: Gaining insight into the user experience, divergent in nature. Central to this is gaining empathy for all members of the learning community of that space, students and teachers. We are redesigning a space to reflect the learning aspirations for learnings in 2018. The 19th century classrooms were build for direct teaching and classroom management and paid little or no attention to the student experience or how these environments made them feel. Interpretation: Grouping the data from Discovery into Drivers and Constraints, convergent in nature. In this sample the drivers of collaboration, movement and ambience are translated into spatial concepts as drivers to support learning and you can see the impact immediately. Ideation: Bringing the drivers to life and creatively solving for the constraints, divergent. In this example I like how the Christian and Melanie anchored the Solution Session to collaboration, comfort and movement as well as aspects such as storage, entry and furniture, each with a unique provocations. As result their ideas are directly focused on solving for the experience. Prototyping: This is a tough aspect for schools to be able to really dive into. The goal is to bring to life various installations for the drivers and constraints but most schools do not have the resources to bring in various pieces of furniture nor have a construction crew to continually modify the space. Hence the importance of experience and low fidelity installations. The space needs be a living space, a space in progress, responsive to the needs of the learning experience. Evolution: You can see immediately the impact the space has on the faces of the students. Capturing those initial reactions is important. If they reflect the your drivers, you are on the right track. The initial buzz will wear off and a more indepth evaluation is essential but the reveal reaction is what you strive to replicate. Hopefully this gives you insight into the what is possible and the process necessary to redesign a learning space. The more you commit to the process, the more of a positive impact the space will have on the learning experience. Redesigning spaces is not going through the Ikea catalog with the teacher. It’s spending the time in the desk with the students, facilitating group empathy activities, listening to understand, and including the community in the process to create the optimal climate for your community’s learning aspirations. Think climate control, not command and control. If this doesn't get you thinking as an educator, what will? I stumbled upon this while sitting through dead time that is so common at most schools, time that you will never get back and is rarely productive, and was immediately inspired. It is big picture stuff, but is there not the possibility to create a bit of this in our own courses? What would the outcome be? I'm going to find out. Watch this space.